Congratulations! You’ve made the decision to have (or maybe you’ve just had) LASIK eye surgery, and now, you’re one step closer to long-term clear vision. Having an understanding of what a LASIK recovery timeline looks like will help make the next few months smoother for you. As with our LASIK consultation preparation guide, this guide is intended to walk you through what you should and shouldn’t do after LASIK surgery. Please note that this LASIK Recovery Timeline is an approximation of what a typical LASIK recovery looks like. This timeline, along with the recommendations shared, may vary from your own recovery process, as well as your doctor’s instructions. One of the most important steps on your LASIK recovery timeline takes place right after surgery: the ride home. Your doctor will likely have given you a mild sedative to keep you comfortable during the procedure. After the procedure is completed, this sedative can leave you too impaired to drive for up to several hours. Because of this, it’s important to make sure you have a ride home, and if all else fails, make sure you have someone to dirve you home (note, Eye Center of Texas cannot release you to an Uber or Taxi driver). How long should you sleep after LASIK? Your doctor will likely suggest that you rest for the first few hours after your surgery (typically, 2-4 hours). In other words, no Olympic training, dissertation writing, or late-night partying — only rest! When you’re resting, consider wearing an eye patch over your eyes. Doing so will help you avoid rubbing your eyes and opening the corneal flap as a result. This is one of the most important LASIK recovery tips for you to follow. Avoid strenuous activity and exercise. Do not play contact sports. Do not shower for the first 24 hours after your surgery. Do not wear contact lenses, even if your vision is blurry. Do not wear makeup or apply creams to your face. Directly after the surgery, patients might experience some eye pain, bloodshot eyes, weeping, sensitivity to light, halos, and irritation (it might feel as if there is a grain of sand in your eye). However, you must remember to avoid rubbing your eyes — despite the irritation. Can you see immediately after LASIK? After three hours, your vision may start to clear up, but it could also take longer. Both situations are normal. If you’re wondering, “How long after LASIK can I see 20/20?” or “How long does it take for vision to improve after LASIK?” it’s important to keep in mind that there isn’t a straightforward answer to this question. Some patients will experience clear vision a few hours after surgery, and for some, it could take a few days. Others might fluctuate between clear vision and blurry vision for up to six months, and some might notice their vision improve gradually for the next six months or so. If you experience any eye pain, call your doctor immediately. This statement holds true for the entire LASIK healing timeline. Your doctor will likely have you scheduled for a follow-up appointment 24-48 hours after your procedure. During this appointment, they will check your eyes and test your vision. It’s likely they will also prescribe you medicated, lubricating eye drops (this is especially true if you’re experiencing dry eyes, a side effect that typically occurs for the first weeks or months after LASIK). Your doctor will also be able to advise you as to whether or not it is safe for you to drive. Their decision will be based on the legal vision requirement for driving in Texas, which is 20/40. Shower, but try to keep soap, shampoo, conditioner, and other chemicals out of your eye. Return to your normal work routine, so long as it does not involve strenuous physical activity. Drive, but only if your doctor states that it’s legal for you to do so. Take a flight, but note that the low humidity typically found in airplanes will make your eyes more prone to drying out. Wear an eye patch over your eyes to help you avoid rubbing your eyes and opening the corneal flap as a result. Wear sunglasses. How long do you have to wear sunglasses after laser eye surgery? Most doctors recommend that you continue to wear sunglasses when you go outside for at least 2 days after your procedure. Do not swim. You’re going to hear this a lot during the next few steps. For more information, check out our blog on swimming after LASIK. As your LASIK corneal flap is healing, your eyes will likely still be irritated. Meanwhile, your vision may or may not begin clearing. If the latter is true for you, don’t panic. Vision fluctuation after LASIK is typical after LASIK surgery, and part of your LASIK recovery time may involve some blurred vision. On the 3rd day after your procedure, you should be able to go outside without sunglasses. However, you may still be sensitive to light. It’s always wise to wear sunglasses when outside, so being extra cautious about wearing sunglasses will do no harm. At this point in your LASIK recovery timeline, your eyes may still have some irritation and sensitivity to light. Difficulty driving at night may also still occur. While you probably won’t feel far along on your LASIK recovery timeline, you’re definitely well on your way to full recovery and better vision. Step 1: Continue to go to your LASIK follow-up appointments . Do not play contact sports. Do not swim. If you need to swim for any reason, consult your doctor first. Do not go swimming without goggles. If everything has continued to go well, your eyes shouldn’t be causing as much irritation as they were toward the beginning of your LASIK recovery timeline. Depending on your eyes, however, your vision may still be in the process of clearing up. After six months, you and your doctor will discuss how often you will need a check-up. These will vary but generally occur every one to two years. After six months, you and your doctor will also be able to tell if LASIK enhancement (PRK) would further improve your vision. 4-5 weeks after surgery: Return to your standard exercise routine and contact sports, if you play them. 4-5 weeks after surgery: Swim, preferably in your own pool. Swimming in public pools, hot tubs, water parks, and natural bodies of water will increase your chances of getting an infection. 4-5 weeks after surgery (or when irritation ceases): Stop wearing an eye patch if you are no longer tempted to rub your eyes. 2-3 months after surgery: Get fitted for contacts, if you need them. Here we are at the end of your LASIK recovery timeline. You made it! The reason we include six months in the LASIK recovery timeline is that your eyes are healing right up into the sixth month. For the vast majority of patients, all LASIK side effects (irritation, difficulty driving at night, light sensitivity, glare, etc.) should have stabilized by this point. The main exception to this rule is patients with nearsightedness, who may require a longer recovery period. The surgeons at Eye Center of Texas have performed over 75,000 successful LASIK eye surgeries, including LASIK for astigmatism. 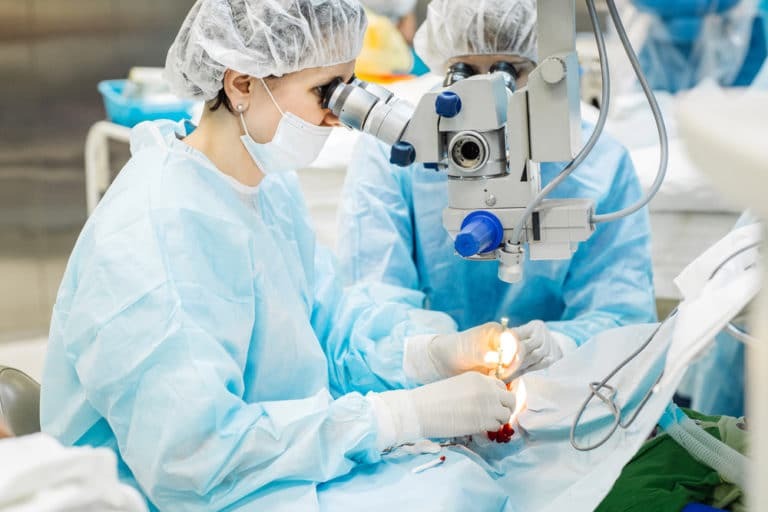 With some of the top ophthalmologists in the nation calling Eye Center of Texas home, you can expect to receive the top treatment and care available for LASIK eye surgery in Houston. Whether you’re just starting to look into LASIK or you’re at the beginning of your LASIK recovery timeline, Eye Center of Texas is here to answer any of your LASIK questions. Give us a call at 713-395-1515 or contact us online to set up a free LASIK consultation today.